Romitaman Original Comic Book Art :: Private Collection :: Fantastic Four #103 p 1 SPLASH (1970) SOLD SOLD SOLD! 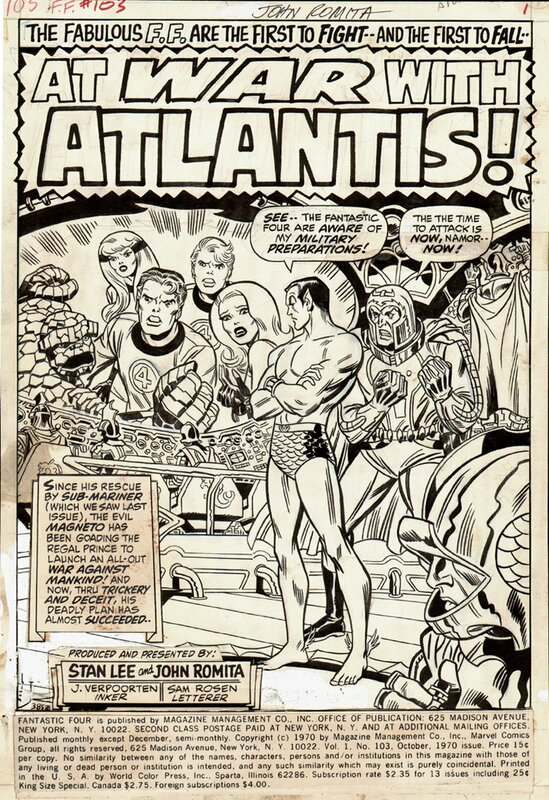 by artist John Romita Sr.
Click Here To See Fantastic Four #103 p 1 From Comic Book! 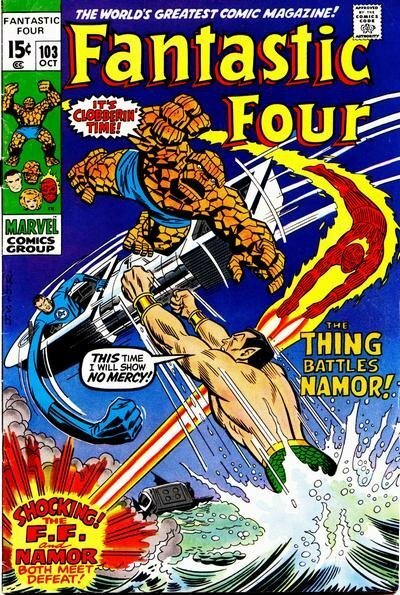 Click Here To See Fantastic Four #103 Comic Book! Check out this HISTORIC 1970 Fantastic Four SPLASH which was penciled by the great John Romita, and inked by the 1970's great: John Verpoorten, from the classic story titled: "At War with Atlantis!" This nice SPLASH features EVERYONE! We have the Fantastic Four: [Mr. Fantastic; the Thing; Human Torch [Johnny Storm]; Invisible Girl] with Crystal also, as Namor, the Sub-Mariner and Magneto plan their next attack! This 1970 SPLASH page right here is the VERY FIRST interior Fantastic Four page since FF #1 that was NOT penciled by the great JACK KIRBY! 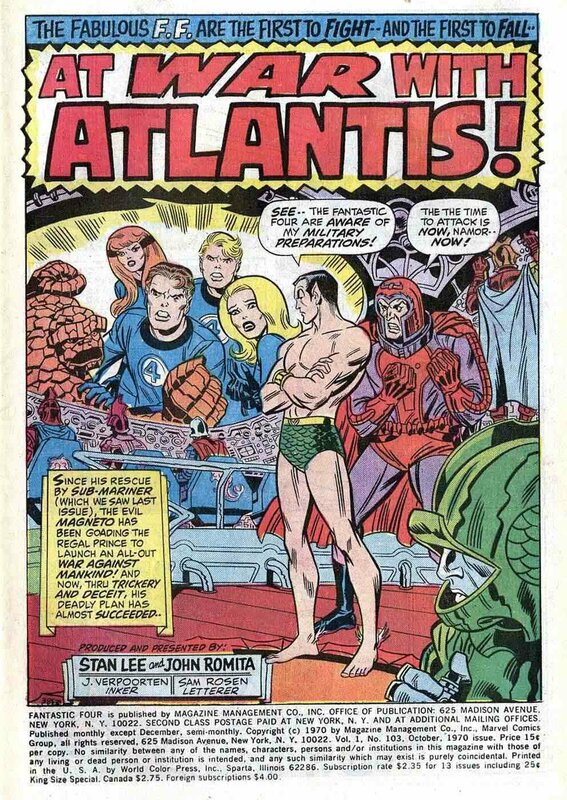 When Jack Kirby sadly left Marvel in 1970, Stan Lee wanted none other than the great JOHN ROMITA to take over the art chores for 4 issues until the great John Buscema was ready to take over the task of drawing THE WORLD'S GREATEST COMIC MAGAZINE starting with FF issue #107! Not many times will you get an opportunity to own such an historic splash than this one, with 6 great heroes and 1 Major villain, all pictured prominently! ALL HIGH end pieces of art, including this one, are able to be purchased with VERY fair time payment plan options, and trades are always considered towards this and "ANY" art on our website! Just send us an email to mikeburkey@aol.com and we can try to work something out.